So did his father before him, until he was gruesomely murdered by a ghost he sought to kill. Now, armed with his father's mysterious and deadly athame, Cas travels the country with his kitchen witch mother and their spirit sniffing cat. Together they follow legends and local lore, trying to keep up with the murderous dead, keeping pesky things like the future and friends at bay. Theseus Cassio Lowood has seen it all, chasing the ghosts all over the country. After a tip off leads him to Thunder Bay, the twelfth high school in the past three years, and Anna Korlov. According to folklore, Anna was sixteen years old when she was murdered in 1958, her throat cut verging on decapitation. They say she wore a white party dress when her body was found, on her way to a school dance but now stained red from the fatal cut, the locals now calling her Anna, dressed in blood. Anna has killed twenty seven teens that have dared to enter the house she once called home, tearing them from limb to limb. The bodies have never been found. The easiest path to knowledge in a new school, is to align yourself with the queen bee, the girl that knows everyone and every rumor and Cas has his sights on newly single Carmel Jones. Cas didn't plan on Carmel's former boyfriend Mike and his friends being part of the packaged deal, until suddenly he finds himself on Anna's doorstep, before he's knocked out and dumped inside the house of horrors. Nobody ever sees Anna, those who do, never live to tell their story... Except Cas. Mike who is suddenly pulled through the window, before Anna tore him in half, never had the chance to tell anybody. But Cas is rescued by Thomas, psychic telepath and the grandson of the tip that bought him to Thunder Bay. Anna is like nothing Cas has ever seen before, she's angry, she's more than just a specter, she's become a demon of vengeance. She's death itself, gruesome and senseless. But she has spared Cas's life and he finds himself wanting to protect her, to save her from becoming what she already is. Anna isn't evil, she doesn't want to kill, she just needs to remember how she died and who condemned her to the house she now haunts. This is what Cas does. His athame weapon passed from generations, with the blood of his ancestors forging the knife, belonging to his deceased father before Cas, the son following in his father's footsteps. The only way to exorcise Anna from the house is by an occult ritual, allowing the group of unlikely teens to see what dealt Anna her cruel fate sixty years ago. The night she planned to defy her mother and step father and attend her first and only dance. But nothing could prepare them from the sheer horror and terror of what Anna has become and who did this to her. When the ritual frees Anna from the binds of the house, the people of Thunder Bay aren't safe... But Anna isn't the problem. It seems whatever killed Cas's father, has finally found them, but this is no ordinary ghost. Cas has been preparing for this fight since his father was killed, but when it comes to ghosts since Anna, Cas no longer has the upper hand. I love, love, loved Anna Dressed In Blood! It was creepy and gruesome in parts, but being a young adult release, you should be able to sleep at night... Perhaps with the light left on. The book is told from Cas's point of view, and he doesn't hold back. He swears, he tells is straight and doesn't sugar coat his words. He also has never had any friends or connected with anyone, having chased ghosts all over the country. For the first time, he finds himself longing to stay in Thunder Bay, with new friends Carmel, Thomas and 'his Anna'. It's a romanticised ghost story, despite the blood and gore. It does venture into creepiness, when Cas not only shares a kiss with Anna, but confesses his love for her. It's beautifully written and I can't wait to read the next in the Anna series. I really enjoyed the first one. The second wasn't as good but still had some great creepy scenes. Nice review! Thanks Renee, and great site over at http://hauntedgravebooks.blogspot.com, I'll be having a look for new titles to add to my list. 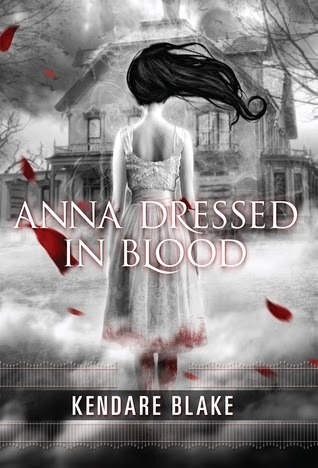 I loved Anna Dressed In Blood, I've had it on my Kindle for quite a while and only wish I had read it sooner. That's disappointing about the second book, I might read it later on in the year after I've cleared my list a little. Thanks for stopping by Renee.